What a week back! I am tired! I finished my 6 essays for an award nomination...and it's mailed! Cross your fingers! Comforted a student that has had separation anxiety since coming back from the break. Made classroom accommodations for 2 students so they can function in class...each came back with a broken arm! Attended an all day professional development session followed by a late night meeting! My class was so excited to have our new student arrive! He is from Taiwan! Very limited English...but super excited to be in our class. My students have been unbelievable helpers. I am so humbled by them! 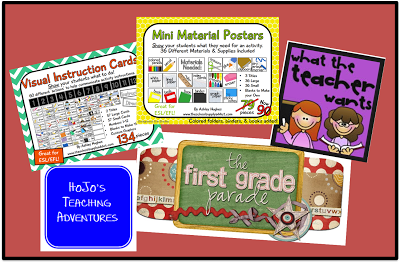 Thanks to some really great teachers who gave me fantastic resources for creating picture schedules and classroom graphics to use for visual prompts. I created a visual schedule for him using some of the items from these sites. The other graphics I use to let him know what item he needs and movements around the room. 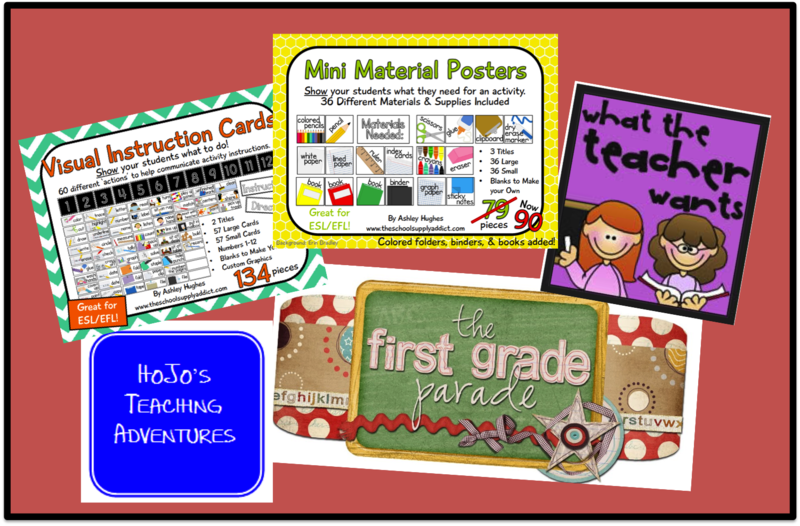 If you happen to get an ESL student in your class, these are some super fabulous sites for graphics! We have had a great week with fractions. Here are a few things that we have done and the resources I used. All fun and engaging for my students! We started off reviewing mixed numbers and improper fractions. I found these Flap Jack poke games! My students loved them. While my daughter and I were wondering around the Dollar Store, I found these plastic aliens. 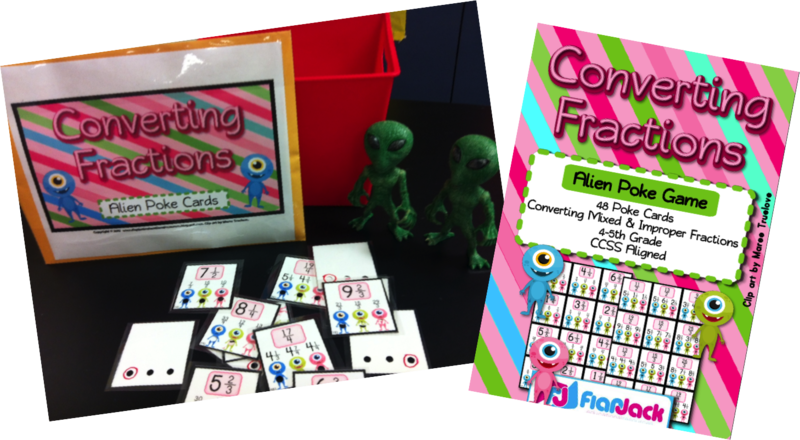 I told my students that the aliens were there to watch over them while they used the cards. They loved the aliens! One student thought they were creepy! Love these Flap Jack games!!!! This one is Space Poke Cards! 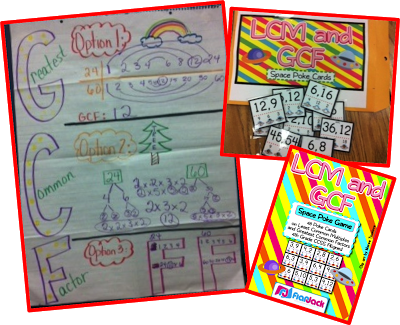 I started with a mini lesson on GCF with the anchor chart and then continued the poke cards in small group. My student loved them! I used this in small group to teach simplifying fractions. We used the hotdog baskets from Target (found in the $ section) for sorting. Just going to mention...Nacho Sort is free! 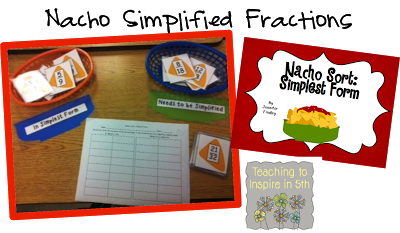 Thanks Teaching to Inspire in 5th! My students loved this activity! Charlotte, I love those baskets! Thanks for sharing pictures of my freebie! I am your new follower! We had so much fun! Thanks for creating such a great activity!